A cataract is a clouding of the eye's natural lens, which usually happens gradually and can make your vision less sharp over time. This natural lens, located behind the iris or colored portion of your eye, works just like the lens of a camera. Your natural lens focuses light images on the retina in the back of your eye which sends those images to your brain. Although cataracts can happen at any age, they are the most common cause of vision loss in adults over 55. More than one million cataract procedures will be performed nationwide this year alone. Here at Lincoln Eye & Laser Institute we offer the most advanced micro-surgical technique in the comfort of our very own AAAHC accredited surgery center. You will be comfortable and in great hands. Many patients with cataracts don't even realize that their vision is changing because it comes on gradually over time. A cataract can often be the reason sharp objects become blurred, colors seem dull or seeing at night is more difficult. Many cataract patients have difficulty both during the day- because of the brightness of the sun and at night- because of the street lights and oncoming head lights from cars. The glare and halos patients experience from light may limit what they can do on a daily basis. Cataracts may also be why you now need reading glasses for the first time, or why the glasses you have for distance no longer seem to help regardless of how many times you've updated your prescription. Many people believe that a cataract needs to be "ripe" or "ready" before they should be removed. This is not longer true. Today, cataract surgery can be performed as soon as your vision interferes with the quality of your life. What should I do if I suspect that I have a cataract? If you suspect a cataract, we recommend that you see your family doctor of optometry or call the Lincoln Eye & Laser Institute at 402-483-4448 to schedule an evaluation. If you prefer to e-mail us with your questions click here. If would like to find an eye doctor in your area click here. What should I expect when undergoing cataract surgery? Cataract surgery is outpatient. During surgery your eye if fully anesthetized so that there is no pain or discomfort. You also will receive IV anti-anxiety medicine to make sure you are relaxed and comfortable throughout the procedure. Unless you have special health problems or insurance requirements, your surgery will be performed in our comfortable, friendly, AAAHC accredited outpatient surgery center at the Lincoln Eye & Laser Institute. Although it may vary, surgery usually takes 20 to 30 minutes, but you will be at our facility between 2-3 hours due to pre-op and post-op time required. You will not be allowed to drive yourself home, but you will probably be able to drive to your one day post-operative visit the next day (assuming you were driving before surgery). If you have difficulty with transportation, please let us know. We can help arrange it. Cataract surgery involves removing the cloudy natural lens and replacing it with an intraocular lens implant (IOL). Drs. 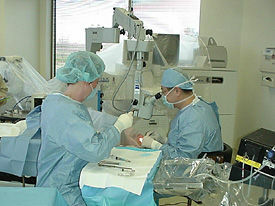 John and James Liu use state of the art micro-surgical techniques using a sophisticated ultrasonic device (phacoemulsification) to remove the lens and replace it with the intraocular lens implant. The implant is held in place by the outer capsule that surrounds your original lens. The IOL implant helps your eye focus properly after surgery but you may need glasses prescribed by your family optometrist about four weeks after surgery depending on what lens you choose. Intraocular lenses are about the size of Lincoln's head on a penny and weigh the same as a kernel of corn. They are polished to the precise curvature needed to bend light rays into focus on the retina at the back of your eye. At the Lincoln Eye & Laser Institute we use the new IOL Master™ technology to provide the most accurate measurements to determine the correct power of your IOL. What lens is right for me? Once Dr. Liu tells you that your vision will be improved by removing your cataract, you have a decision to make together. The replacement lens you choose will determine your vision for the rest of your life so it's important you consider all of your options. Although all replacement lenses are made of the same high quality material that will provide you excellent vision after surgery, these lenses are made to do different things depending on how you would like to see after cataract surgery. The health and unique characteristics of your eye also play an important role in which lens choices are available to you. There are numerous styles of IOLs. Your Lincoln eye doctor will carefully choose an IOL that will meet your vision needs and give you the best possible vision. Proven to deliver excellent visual performance, the AcrySof® IQ IOL provides improved functional vision in all conditions and dramatically improves clarity, image quality and contrast sensitivity. Astigmatism is a common condition where your eye is out of shape, more like a football instead of a basketball. For cataract patients with astigmatism, successful cataract surgery is only half the battle to regaining quality vision. Until recently, the only viable vision options for patients with astigmatism were to correct their astigmatism after cataract surgery with glasses or contact lenses. Not only do these options limit your lifestyle after surgery but are also very expensive over the rest of your life. 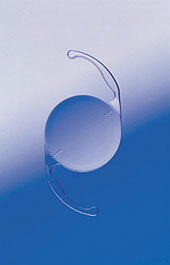 But now, for patients with astigmatism, the AcrySof® Toric lens is a great option. The AcrySof® Toric lens is a revolutionary astigmatism correcting lens that Dr. Liu may implant during cataract surgery to replace your clouded lens and reduce your astigmatism in one simple procedure. The unique design of the AcrySof® Toric lens makes it possible to reduce or eliminate your corneal astigmatism to give you the best quality of vision, considering the astigmatism in your eye. We highly recommend you ask to hear more about this option as many of our patients have been very happy with their results of the Toric lens. More and more patients are choosing to turn back the clock 25 years and, with recent advancements in lens replacement technology, now they can! Traditionally, single vision lens implants to correct distance vision were used exclusively for cataract surgery. Single vision lenses provide only one focal point, typically distance, leaving people dependent upon reading glasses or bifocals after cataract surgery. The great news is you are encountering cataracts at a time when lens technology has taken great leaps of progress, allowing you to truly see like you were 40 again. Multifocal lens implants, such as the +3 Add ReSTOR® lens, are designed to improve your vision at all distances, near through far away, with a reduced dependency on glasses. This advancement in lens technology allows us to help you maintain vision as you age better than ever before in the history of ophthalmology. Please take time to consider the lifestyle you want and the activities you enjoy and how this lens will improve those things for the rest of your life. We highly recommend you ask to hear more about this option as many of our patients have been very happy with their results when choosing the +3 Add ReSTOR® lens. For more information on Multifocal Lenses, click here available at Lincoln Eye & Laser Institute.